Pyongyang has denied reports it provided Damascus with components to produce chemical weapons, denouncing them as a fabrication by the United States to exert pressure on the country, the KCNA news agency reported. "As we have clearly said several times, our republic does not develop, produce and stockpile chemical weapons and opposes chemical weapons themselves," KCNA cited the spokesman as saying, who also added that it was a “dirty trick” to stir up the atmosphere of sanctions and establish a total sea blockade of North Korea. In February, US newspapers shared a yet-unreleased report by the United Nations accusing North Korea of sending material to Syria to make chemical weapons. Earlier the same month, the notorious White Helmets, which have repeatedly falsified facts and what they describe as evidence, claimed that the Syrian Government had deployed chlorine gas against the town of Al-Shifoniya town in Eastern Ghouta, killing one child and causing "widespread suffocation" among the local populace, the Anadolu Agency reported. Commenting on the reports, US Department of Defense spokesperson Dana White said the United States "had not seen any evidence yet" of the use of chemical weapons by the Syrian Government in Eastern Ghouta. 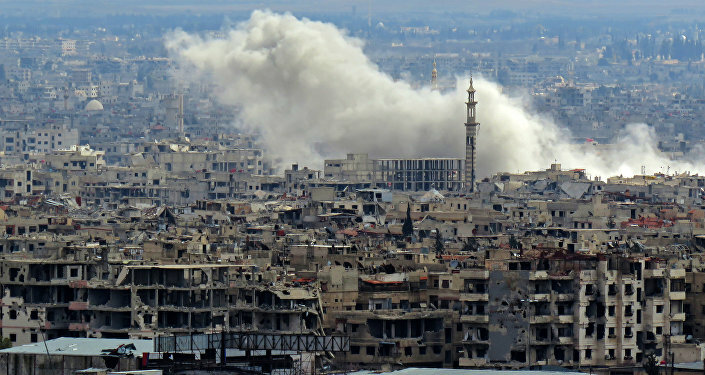 Damascus, for its part, has repeatedly denied allegations of having used or planning to use chemical weapons in the warfare, explaining that the country had none in its possession. North Korea has been under stringent UN sanctions since 2006 over its ballistic missile and nuclear programs, with the Security Council has scrutinizing the measures in response to Pyongyang’s sixth nuclear weapons test and several long-range missile launches.